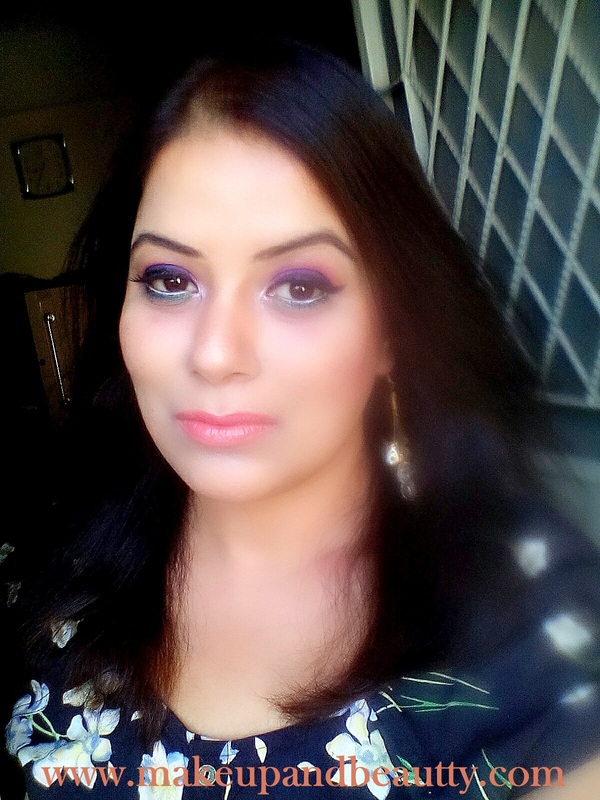 I love neutrals only when I want to play safe but I love brights when I am experimental on my own way..."
You must be wondering what I am saying today. 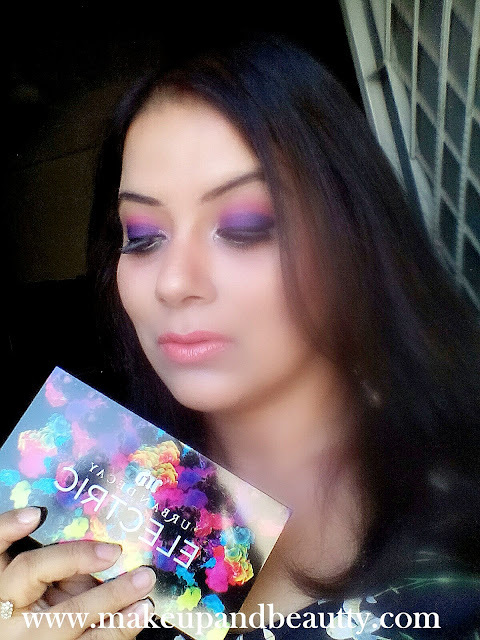 Actually, today's post is all about URBAN DECAY ELECTRIC PALETTE. The palette that has 10 beautiful bright shades, the palette that finally completes my initial collection (as urban decay have huge eyeshadow range) is the talk of the post today. Price:- Rs.3790/- (I brought it by a gift coupon and royalty discount for which I had to pay 3275/- for my palette, no customs). It is an Electric Pressed Pigment Palette: 10x Pressed Pigment, 1x Double Ended Pressed Pigment Brush. Urban decay is one of the leading brands that makes some perfect eyeshadows always. The eyeshadows are at their best quality. 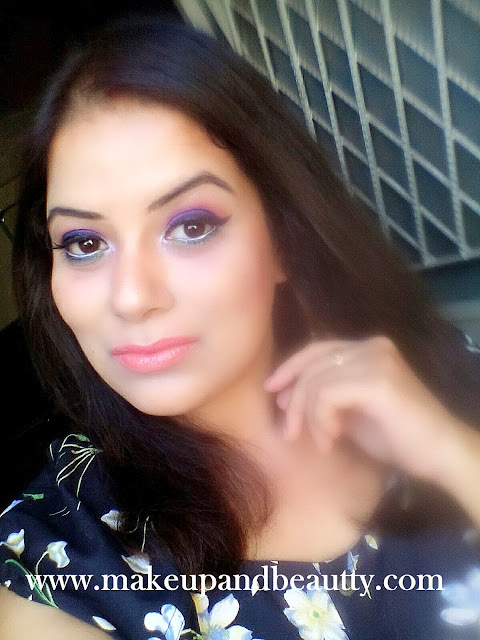 After grabbing URBAN DECAY NK 1, 2, 3 palettes, URBAN DECAY ELECTRIC PALETTE, was on my list long back. 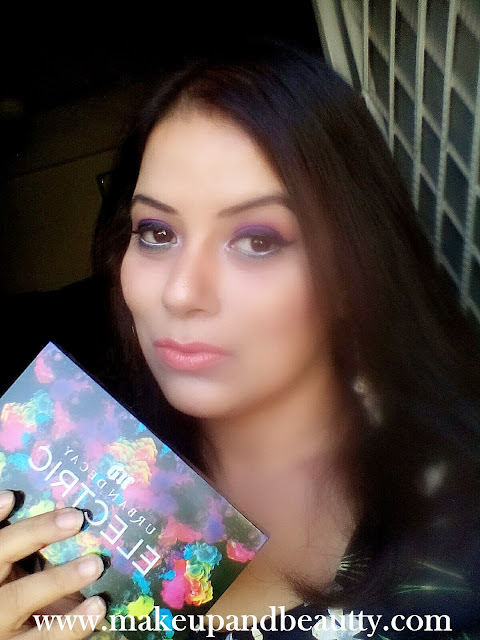 So when I receive a gift coupon from Strawberrynet for which my palette was in discount I just blindly grab this palette to complete my collection of URBAN DECAY EYESHADOW PALETTE (I know another palette is already launching and that too I might grab in near future if only I want some neutral best matte eyeshadows). The palette comes in a beautiful sturdy colorful packaging. Both the outer box and the palette have similar colorful outlook. The palette is pretty sturdy and little heavy, which makes the eyeshadow really safe. The palette has the magnetic closure for which it is travel-friendly too. It comes with a dual ended brush and with a huge mirror which is enough for applying the eyeshadow or for any touch ups. As the palette is colorful and so are the bristles of the brush too that comes with this palette( which are purple in color instead of usual black or white or shaded one). The brush is a dual ended pressed pigment brush, as I told you earlier. It's one side is perfect for applying and blending eyeshadows over lids while the other side is good for precise application. Coming to the shades, SLOWBURN, JILTED, SAVAGE & URBAN are not meant for sensitive part of eye area like tear duct one. Rest all can be applied on waterline. I used the above mention shadows for my lower lashline avoiding tear duct area and they are quite ok. But still I would not recommend you all to try those shades on waterline. The palette consists of 10 beautiful brights shades that are perfect for creating any bright look. The shades are super pigmented. And there are no fallouts in any shades. The shades work at its best if they are applied by dabbing the shadows over the lid with a semi wet brush. The eyeshadows without any primer stay 6 hours on my oily lids without any creasing. After 6 hours , I saw a slight creasing on my crease area which can be avoided with a proper primer over the lid. The brush that comes with the palette is pretty helpful one and in fact, one can create any look using that brush only. The sky blue, the orange, the lime shades are light shades in the palette but still they are super pigmented which are just beyond my expectation. Over in all my thoughts regarding this URBAN DECAY, ELECTRIC PALETTE is " when it is URBAN DECAY eyeshadow palette, you don't need any recommendation to try it". I am very happy with my purchase and do recommend everyone to grab this palette if you are a bright eyeshadow lover like me ;) . Strawberrynet.com sometimes come up with 10% discount, so keep your eye on that site so that you can grab this palette in little discount or if you don't want to take risk from international site you can try out Instagram seller LAMAKEUPAFFAIR for this palette. I know and I admit that URBAN DECAY is the brand that comes with a price tag which is why everyone can't afford it so here I am listing you few closer dupes of URBAN DECAY ELECTRIC PALETTE. NYX ULTIMATE EYESHADOW PALETTE IN BRIGHTS (reviewed it here). MORPHE EYESHADOW PALETTE IN 35B (reviewed here). Both the eyeshadow palette I mentioned here are permanent one, so you can definitely grab it anytime. For NYX try out NYKAA.COM, as I bought the palette from there only and for MORPHE ONE there are few Instagram sellers who sell this Morphe palette like LAMAKEUPAFFAIR, LACHICWICK, THE_MAKEUP_STORE_INDIA, BEAUTY.SPLURGE and much more. 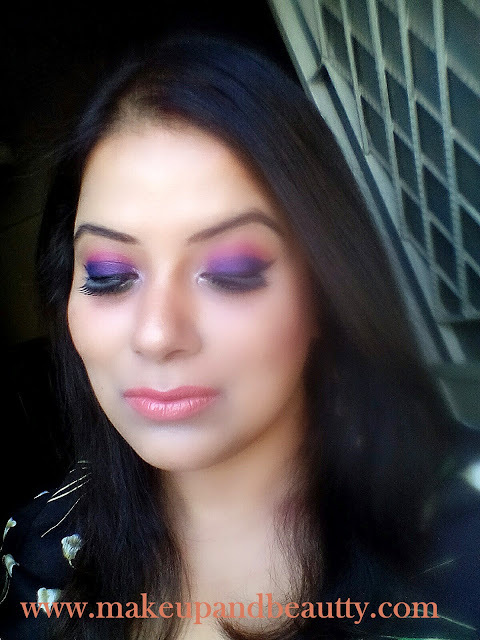 Have you tried URBAN DECAY PALETTE? 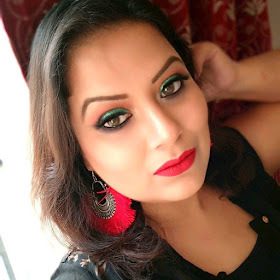 [AS I AM GETTING SO MANY QUERIES REGARDING INSTAGRAM SELLERS,SO I DECIDED TO GIVE YOU A RECOMMENDATION AS MUCH AS I CAN IN MY EVERY MAKEUP RELATED POST].